Samsung Galaxy J7 Prime review: This one does come with some fairly impressive specifications for its under Rs 20,000 price. Samsung has enjoyed a kind of dominance over the mobile market like no other manufacturer. They have phones in every price and performance bracket, offering something for literally everyone. The Samsung Galaxy J7 Prime is the Korean company’s attempt to offer something that’s powerful in a somewhat lower price range. First off, here’s what Rs 18,790 gets you: Samsung’s own Exynos 7870 Octa-Core CPU (1.6 GHz Cortex-A53) paired with 3GB of RAM. For those who may not be familiar with the SoC, the Exynos 7870 comes in an arrangement of eight A53 cores that can be clocked up to 1.7 GHz and can run displays up to 1920×1200 resolution along with support for Image Signal Processing for up to two 16MP cameras. Samsung Galaxy J7 Prime: This one has a 5.5-inch SAMOLED full HD display. On the Samsung Galaxy J7 Prime, the SoC is performing pretty much at its maximum with the clock speed, a 1920×1080 IPS display, a 13MP camera on the back and a 8MP camera on the front. In case you’re wondering, the Exynos 7870 features in the same performance bracket as the Snapdragon 650 and as such, isn’t a power-horse of an SoC. Sadly, it only comes with 16GB of onboard storage, which is weird in the day and age where the cost of storage chips is being driven into dirt. Nonetheless, Samsung built a microSD card slot onto the phone that supports cards up to 256GB in capacity. There are also two sim-card slots, and no, one of them isn’t used up by the microSD card slot. Unlike the non-flagship products that Samsung has released in the past, the Samsung Galaxy J7 Prime is actually really well built. It doesn’t exude the elegance of the Edge 7, but the build is really well put together. Unlike the non-flagship products that Samsung has released in the past, the Samsung Galaxy J7 Prime is actually really well built. It doesn’t exude the elegance of the Edge 7, but the build is really well put together. The phone has a metal build with the front being protected by Gorilla Glass. The edges of the glass blend smoothly into the body, leaving no obtrusive edges. The back is smooth with the camera unit and flash sitting flush with the body. Interestingly though, Samsung has placed a mono speaker on the ride side of the phone instead of the underside. The power button sits well-spaced from the speaker and the left side of the phones are adorned with the volume rocker. A fairly standard configuration of button placement. The build is what you would expect from a phone in this price range, so that should offer you some peace of mind. Samsung has chosen to go with a 5.5inch 1920×1080 TFT-LCD screen for the Galaxy J7 Prime, a kind of a deviation from its forte. Displays are kind of Samsung’s thing. The Galaxy Note 7 came with the best AMOLED display yet, but unfortunately the phone couldn’t stop exploding and had to be pulled off the shelves. Interestingly, Samsung has chosen to go with a 5.5inch 1920×1080 TFT-LCD screen for the Galaxy J7 Prime, a kind of a deviation from its forte. The display has a pixel density of roughly 400 pixels per inch, adequately dense to render rather pleasing amount of sharpness. Using the phone under the mid-day sun, the display is adequately bright, with good colours and contrast. Unfortunately, the top glass panel on the phone is rather reflective in nature and in bright light, hinders good legibility. Using the phone over the course of 10 days, there’s a lot that can be said about the way the software and hardware come together. The phone runs Samsung’s heavily customised TouchWiz UI which hosts Android Marshmallow at its core. Upon booting up the phone, our unit froze on the country selection screen and had to be force-rebooted. A minor hiccup which we got past fairly easily. During the setup process, the phone will ask you to setup not just the pin and fingerprint locks, but also S-Power Planning mode and S-Locker, two features that Samsung seems to have developed with India in mind. We chose to setup all of these later. Once the phone was ready for use, we noticed that it comes with a host of Microsoft Office apps pre-installed, which is great for anyone who uses the suite often. Once we had our favourite apps installed, we put the phone through a battery of usage tests. We started with gaming where Subway Surfer played out fairly well, but that is to be expected given the low resources it uses. We moved to Asphalt 8 for a 45-minute run and that’s where problems started to crop up. While the gameplay itself was fairly smooth with minor stutters, the in-game menu response was bad and lagged quite a bit. There was also the issue of the phone heating up noticeably in the first five minutes of gaming. Similar problems occurred during our 45-minute gameplay of Modern Combat 5 as well, leading us to believe that while the Samsung Galaxy J7 will let you run the most demanding games, it won’t be able to deliver a 100 per cent smooth experience. Photo editing on the Samsung Galaxy J7 wasn’t a problem though, as Snapseed, Lightroom and even VSCO ran fairly smooth. We did notice Lightroom taking longer than usual to import files from camera roll and even longer to render final JPG output, but it really wasn’t a deal breaker. The most frustrating experience with the Galaxy J7 Prime were random crashes. Even without having run S-Health, every 15-20 minutes or so, we kept getting an error that “S Health has quit unexpectedly.” Asphalt 8 and Lightroom suffered the same issue every now and then and a re-installation of the apps didn’t solve the problem. The issue was intermittent though, and it’s possible that a full reset of the phone could eliminate the issue. Samsung’s Galaxy J7 Prime offers 13 MP on its primary camera and 8 MP count on the front. Neither camera offers RAW output so that’s a little disappointing. The primary camera sports a number of shooting modes such as Panorama, HDR, Night Mode, Beauty, Sport and Sound and Shot. The auto mode functions as you’d expect, however, the “pro” mode only offers the ability to adjust white-balance between preset modes (no ability to set custom colour temperature), adjust ISO and tweak exposure compensation. In all honesty, the pro mode is significantly lacking in features and you’re better off using a third party app that gives you more control. The night mode was something that we found to work rather well. The phone internally boosts the sensitivity of the sensor so that your exposures are not underexposed. The photos do have little noise, but the aggressive noise reduction can be evident in the shadow areas. What we did find to be very interesting is that some images out of the camera have a DPI of 150 while others were shot at 72DPI. This wouldn’t make any difference to you if you were looking to share your photos digitally, but in the event you do decide to print your works of art, the DPI might be a limiting factor in how big a print you can generate. Overall, the camera functions very well during the day, with images that are pleasingly saturated and capture decent amount of contrast. At night time though, the focus is terribly frustrating and the Pro modes lack of manual focus adds to our woes. The front facing camera is an 8-megapixel shooter and it’s a decent performer. We’d recommend finding a light source to light up your face (or group) if you’re trying to take a selfie in low light as the photos will be fairly noisy. Surprisingly, the distortion is fairly well controlled on the front camera, something that we don’t get to see very often on front facing cameras. Samsung has created various features that are specifically designed keeping the Indian user in mind and S-Power is one of them. While most Android phones offer a battery saver mode, Samsung takes it to the next level with S-Power. 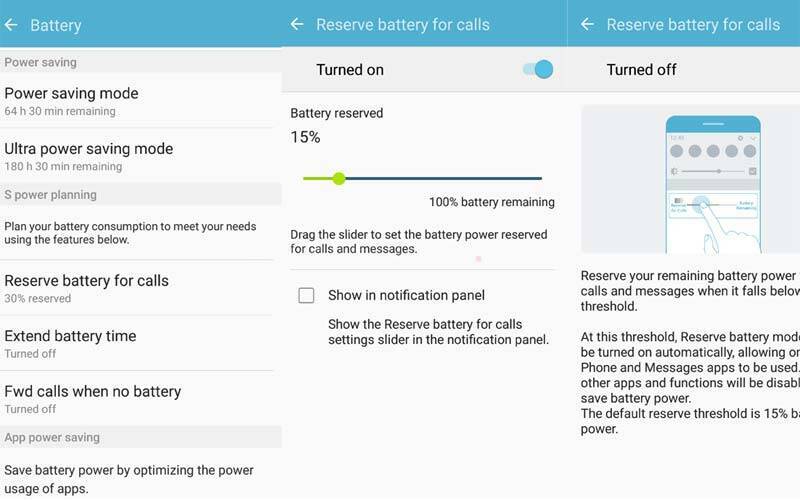 S-Power can be configured to reserve battery for calls, to extend battery time and even forward calls to another number in the event your phone’s battery does die. Additionally, there’s also an Ultra Power saving mode which limits the number of apps that can run, and the services that remain active. We tried out all the modes and feel that the Ultra mode is best for those who need a device alive to make and receive calls and text. Our notifications for WhatsApp and Skype weren’t coming through when the phone was on this mode. With all of the battery saving features turned off, the 3000mAh battery of the Samsung Galaxy J7 Prime lasted us for an entire work day without any issues. This includes HEAVY usage of WhatsApp, Facebook and a significant number of phone calls. Typically, an iPhone 6s would have died halfway through the day, but the Galaxy J7 Prime managed to get through the whole day without any issues. You can extend the battery life by another 12 hours or so by turning on any of the S-Power modes, but frankly, if you’re able to charge the phone at night while sleeping, there really is no need for extended battery life. However, in the event you’re planning a trip to places where electricity is scarce, the power saving modes will really come in handy. Samsung Galaxy J7 Prime retails for Rs 18,790. It comes with medium-tier specs that have been a standard for this price range. It performs as expected, however the occasional and random crashing of apps was definitely somewhat of a concern. The camera performs really well in good light and manages to keep the images noise free in relative darkness too, albeit thanks to aggressive noise reduction. By itself, the phone is a good option for anyone looking to shell out money for an impressive battery life. However Lenovo has introduced the Z2 Plus for just Rs. 17,990 packed with a more powerful Snapdragon 820 processor, 3GB (or 4GB depending on the variant) of RAM and matching camera and display specs. The Lenovo Z2 Plus also sports a bigger battery, but it may not come with the optimisation the Samsung Galaxy J7 Prime sports, making a choice between the two harder.